every time I think I've found the perfect baby blanket, another one comes along. Bubblecakes is the latest on my list of blanket love. My favorite part, the personalization. 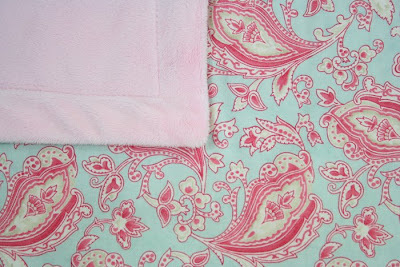 The blankets come in a variety of styles: modern, vintage, retro and more. 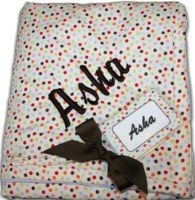 Each blanket is made from the highest quality cotton and backed with ultra soft minky in coordinating colors, but no blanket is complete without your choice of personalization and a coordinating diaper bag tag. At Bubblecakes we specialize in baby blankets. Our goal is to create a boutique quality, unique and stylish, personalized baby blankets, that will become a special heirloom to be cherished for years to come. 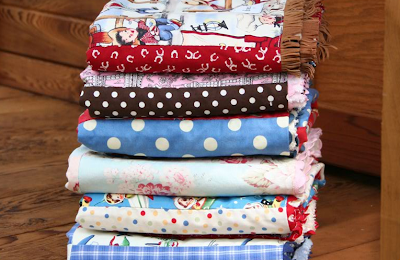 I think Bubblecakes has more than met their goals, and I can't wait to add one of their heirloom blankets to baby #3's collection. I just checked out this website and DANG, the prices are STEEP for my budget, but they look SO AMAZING. I need to wait till they do a sale if there is such a thing. What a fun shower gift. Love the colors and patterns! Delightful little finds like this always make me wish that we could have more babies... *sigh* :") One of those bittersweet feelings, since my boys are already at the toddler stage now.